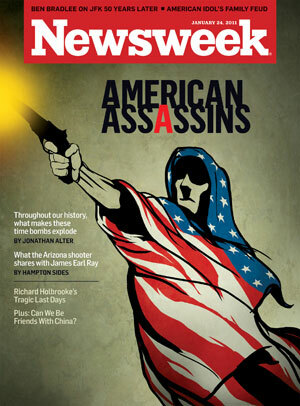 The shadowy character pictured on the cover of Newsweek’s Jan. 24 issue, out Monday, looks like a comic book villain. Shrouded in an outsize American flag that smothers his body like a Snuggie, the menacing figure aims a pistol skyward, squeezing the trigger with his right hand. The accompanying headline, “American Assassins,” touts the latest entry in a long series of pieces seeking to explain the Jan. 8 shooting spree outside a Tucson, Ariz. supermarket that claimed six lives and left Congresswoman Gabrielle Giffords critically injured. Indeed, daily papers, blogs, news websites and cable networks were on the front lines of this tragic story, which has captured the American media’s attention for the past nine days. Reporters descended on Tucson, churned out scoop after scoop to advance the overall narrative, even if only incrementally, and tracked down Loughner’s neighbors, friends, professors and former classmates. At the same time, the weeklies were busy preparing their long-view takes and presenting compelling images to package their more conceptual treatments of the subject. It’s a delicate balance — go too far and risk being accused of yellow journalism; play it too safe and risk being lost in the crowd. Take Loughner’s ubiquitous mugshot. The disturbing image, which shows the 22-year-old accused gunman bald and black-eyed with a crooked, remorseless smirk, proved to be nearly a textbook example of a powerful front-page newspaper photo. Whether it makes for a good magazine cover is another matter. Newsweek, for one, didn’t consider using it. “I think everybody had seen that image,” said Alter. 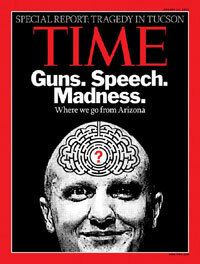 But that didn’t deter Newsweek’s rival, Time, whose first post-Tucson issue came out several days earlier. 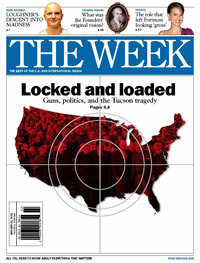 The Week, a digest of news and commentary whose latest issue came out Friday, also decided to forgo a cover image of Loughner’s haunting gaze. “It’s an incredibly newsworthy picture, but there’s so much madness and glee coming out of his face that it’s hard to look at it blown up in a big way,” said Falk. Falk also said he didn’t think the image was appropriate to go with the standard caricature illustration that almost always graces his magazine’s covers. “It’s too somber a story,” he said. Meanwhile, over at The Economist, it became clear last Monday “that our intention was to put this [story] on the cover,” said Edward McBride, the magazine’s Washington correspondent, who penned one of two lead features from this week’s issue. 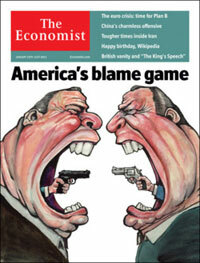 “America’s blame game,” reads the cover line. Below it is a cartoonish illustration of two fat politicians engaged in an angry face off, handguns protruding from their over sized mouths. The concept, McBride explained, was two-pronged. This entry was posted on January 17, 2011 at 10:14 pm and is filed under Uncategorized. You can follow any responses to this entry through the RSS 2.0 feed. You can leave a response, or trackback from your own site. There are endless news reports of the threats made prior to the event with Giffords taking no action to secure the event she staged. Had it not been for Gifford’s presence on that day, there would be no dead people or victims that day. I believe she actually needs to receive the death penalty for her crimes, but it may more likely be something like involuntary manslaughter and aggravated assault on multiple counts.